Eoin Colfer’s, Hangman’s Revolution, is a thrilling novel which is full of action and suspense and had me on the edge of my seat from start to finish. Hangman’s Revolution is an exciting science fiction novel and the second book in the Warp series. There are five main characters; Chevron Savano, Riley, Otto Malarkey, Lunka Whitmeyer and Clover Valliocose. First, Chevron Savano or “Chevie” is an ex-special ops FBI agent with skill in combat and with many weapons. Second, Riley is an orphan boy who was brought up by an evil murderer and has been trying to escape him ever since. Additionally, Riley is a skilled magician with decent hand to hand combat skills. Third, Otto Malarkey is a Victorian London gang leader who prides himself on having amazing hair and combat skill but is also a friend of Riley. Fourth, Lunka Whitmeyer and Clover Valliocose are from the altered future in which the story begins. They are the dictator’s minions and are considered “bad guys” in the story. The story begins in an altered future in which a dictator, Colonel Box rules the world. The dictator came to power because he went back in time from the real future and took over the world. In the altered future, Chevie still has memories of the old future and her previous adventure to Victorian London. For this reason, Chevie looks suspicious and is thought to be a spy from a rebel nation and is quickly sentenced to be executed. Although there is one way she can escape punishment, she must kill an old man who is also thought to be a traitor. Following a twist, and the old man’s death, Chevie is suddenly caught in a time portal in his house and sent back to Victorian London along with Whitmeyer and Valliocose. Upon arriving, Chevie is immediately caught running from Whitmeyer and Valliocose. Chevie quickly joins up with Riley and Otto. Chevie immediately convinces Otto and Riley that they must try to stop the dictator, Colonel Box, from taking over the world. Throughout the story, the trio tries to take down Colonel Boxe’s army from taking over the world and altering the future. Hangman’s Revolution is an engaging, exciting, action packed, “can’t put it down” (Voice of youth advocates) novel. I love how in Hangman’s Revolution Eoin Colfer puts every detail down to the color of the street the characters are on or the smells which are surrounding them. Colfer also includes specific character traits among the action which gives the book a perfect balance. Including funny and engaging dialogue, Eoin Colfer improves the reading experience even more. The book is written in third person perspective which enhances the experience because one can tell what all the characters are thinking instead of just the one which the book is being told from. I really liked Hangman’s Revolution because its main theme is friendship. Friendship is shown by many characters, but specifically by Riley and Chevie. Their dangerous times formed a bond between them and they always look out for one another. The setting in which most of the book takes place, Victorian London, is a superb setting for the book The overpopulated city makes a perfect setting for the book, because it throws many new aspects of life at those from the future such as rancid smells and extremely tightly packed living. Lastly, I enjoy Colfer’s writing style and his writing always makes sense and has good flow. Unlike many authors, Colfer’s writing is easy and clear to read. I would recommend this book for children ages ten through fifteen because it is fairly complex with the idea of time traveling for young kids but it will still entertain mid-teens. 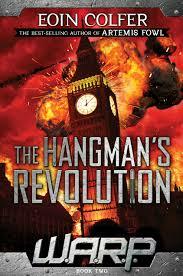 Hangman’s Revolution is a great book full of suspense and I would highly recommend it.